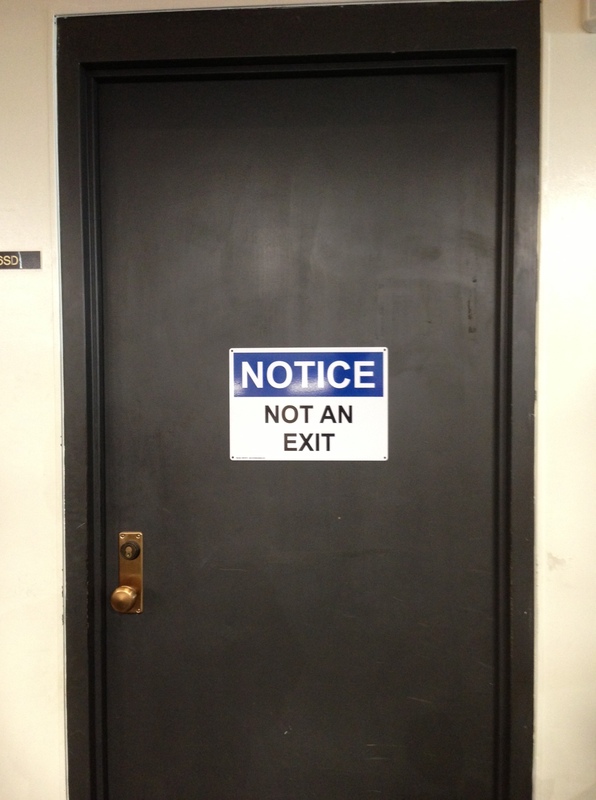 This one was sent to me by Wayne, who rightly wondered why this sign needed the word “NOTICE” at the top. I suppose that header might make sense in a context in which people are primed to expect notices to be labeled as such (perhaps to differentiate them from other kinds of signs, such as how-to signs or nameplates). 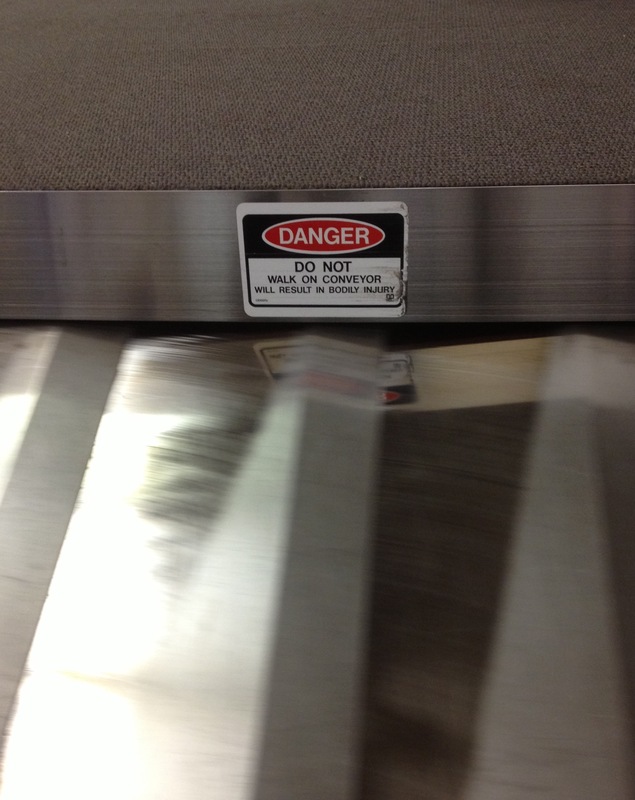 This one is from the baggage carousel at an airport. 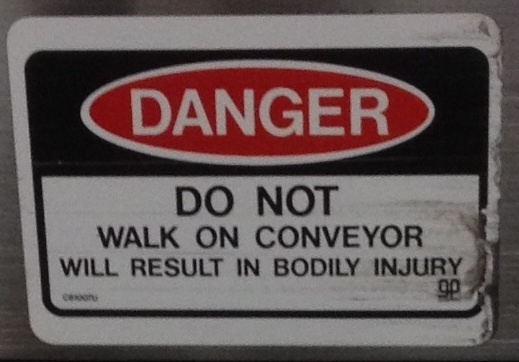 I like the fact that it asserts so confidently that walking on the conveyor will result in bodily injury. It kind of reads like a threat. This is an odd one from I saw during a recent flight. 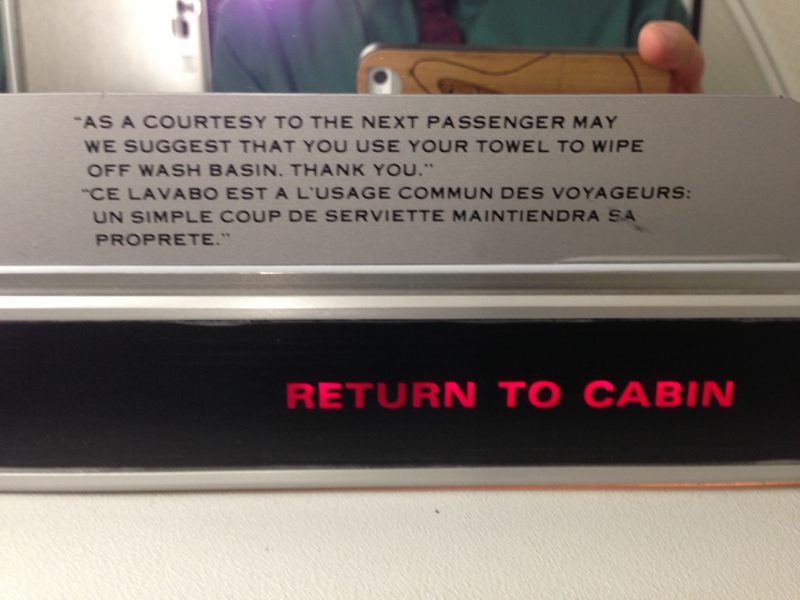 It’s very prominently displayed in an airplane bathroom — an environment replete with normative signs. But, oddly, it’s presumably not directed at passengers, who presumably have no obligation to install waste containers. This one is from Samantha Brennan. It’s posted at the University of Sheffield’s conference housing. 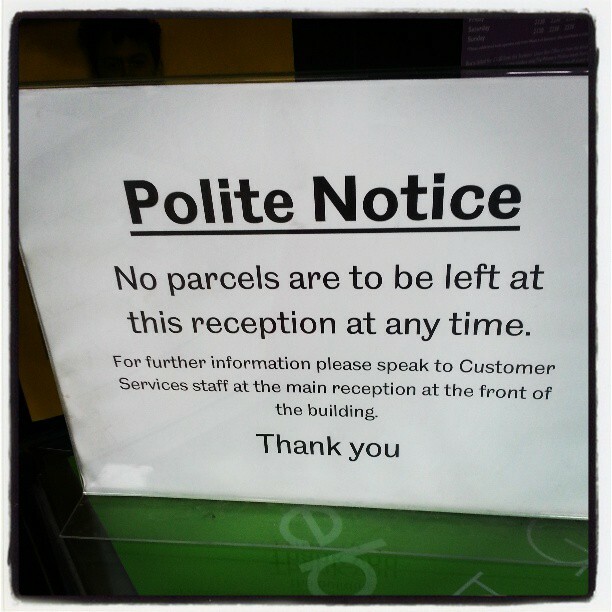 I like the fact that this sign actually asserts that it is, in fact, a polite notice. I guess the “thank you” at the end wasn’t enough. 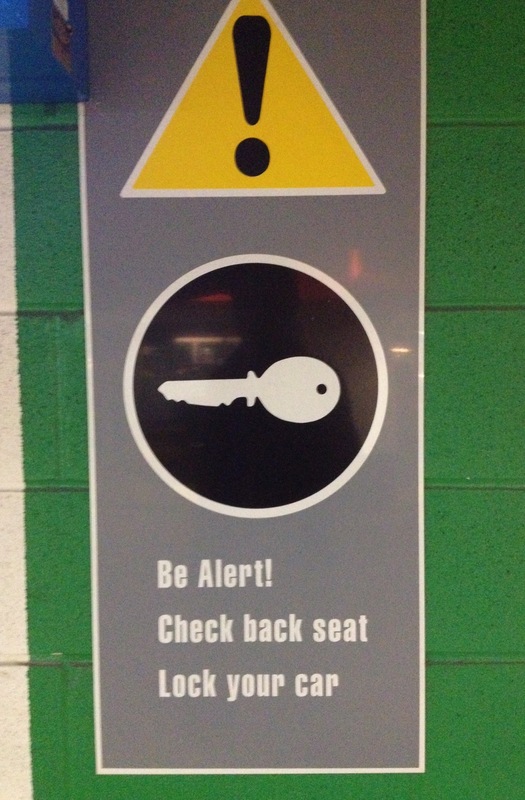 This sign is in the parking garage under the building I work in. I guess it’s a warning designed to help you avoid being carjacked. If so, it’s a crazy sign. Car jackings are virtually unheard of here in Toronto, as far as I know. After I posted on the bathroom courtesy sign in airline bathrooms, Wayne Norman sent me this similar-but-different sign, which is in the bathroom on an old American Airlines MD-80. In this version, wiping the counter isn’t just courtesy; it’s a matter of solidarity among people using a shared resource. Kudos to Wayne for sticking around to take this picture for me, in spite of the other red normative sign apparently flashing at him at the time! I love this because of the way it appeals to courtesy in what is otherwise a highly normative and indeed highly regulated environment. A passenger jet is just abuzz with injunctions and limits and prohibitions and admonitions. All sorts of stuff is just plain forbidden. But in the bathroom, along with various prohibitions (e.g., tampering with the smoke detector!) is this one lovely suggestion that you might just want to do something courteous for the next person to use the facilities. 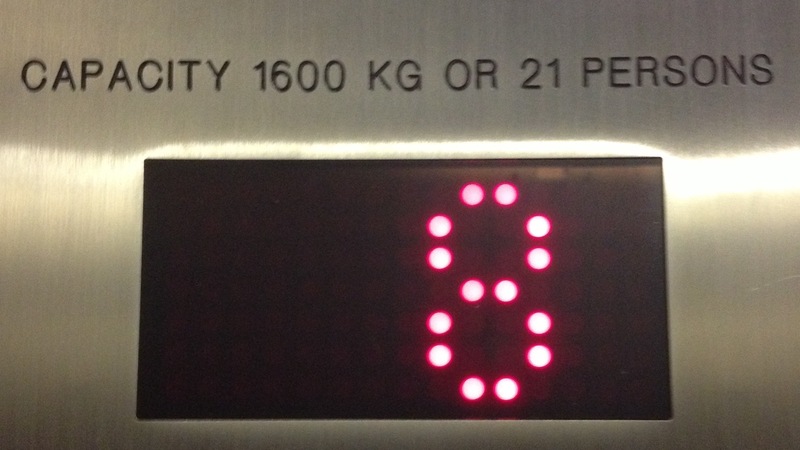 Elevators standardly have signs like this one, indicating maximum number and weight of passengers. This is good information, on the face of it. No one wants the elevator they’re in to fail. In this context, it seems like a normative sign, rather than a sign that merely provides information. But just how is anyone supposed to act on the maximum weight? Does anyone ever poll the crowd, gathering individual weights and summing them? I’m especially fond of normative signs that give reasons for their injunctions. I suspect that one side effect of the sheer volume of normative signs in our lives is that we tend to ignore them; so at least some sign-posters try to emphasize that their signs are not arbitrary, but grounded in reasons we all care about. 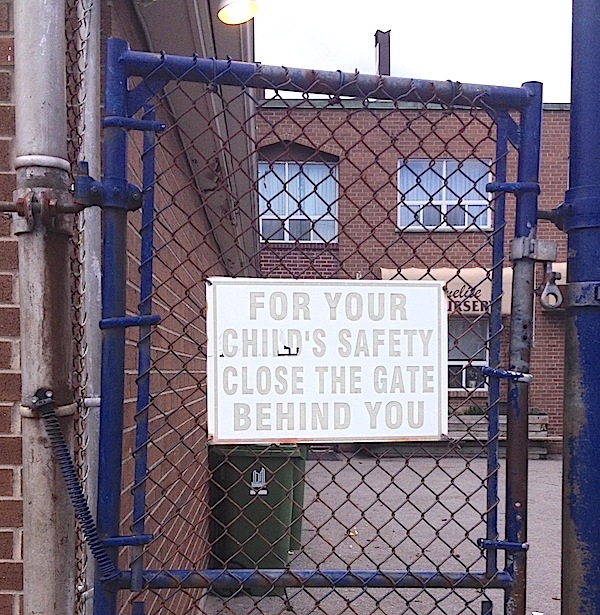 This one is on the gate of a preschool near my house. I guess if it’s worth doing, it’s worth overdoing. But surely this is overkill. Or it should be. How much warning should anyone need to stay away from high voltage? 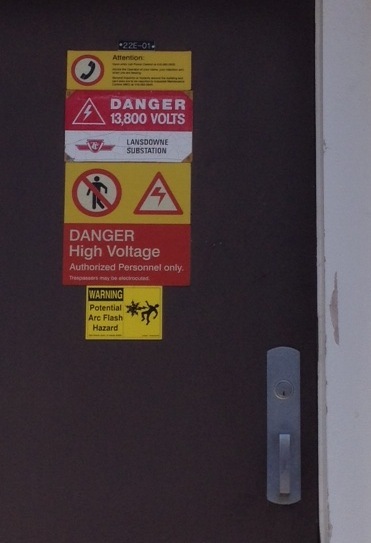 This is the door of an electrical substation in my neighbourhood. Any one of those warnings ought to be enough. It’s electricity, OK? Stay the hell out! See also: “Danger, Danger: High Voltage!” by Electric Six.